You know those 5k runs you might do on a Saturday morning in your local park (or other green-ish space)? Well, this year, we’re bringing the idea to Greenbelt. But because it isn’t officially one of those Saturday morning runs in a park-type-thing, we are calling it greenbeltrun. 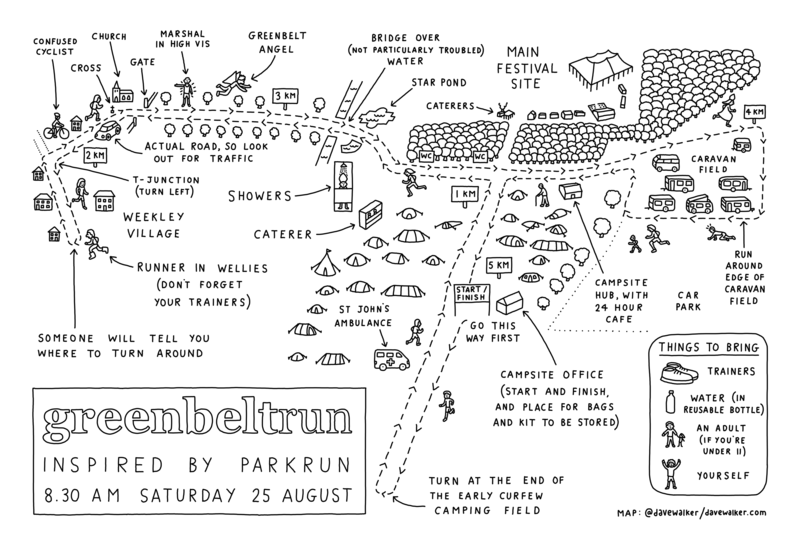 If you fancy taking part in the inaugural run (or walk, let’s be honest) take a look at the greenbeltrun website and sign up here and you will hopefully get all the answers to any questions you might have. It will happen at 8.30am on the Saturday morning of the festival. Don’t worry about being last! We’ll have someone at the back, checking everyone is okay. You literally cannot be the last one to finish! If you’re a regular runner in a park, don’t worry about barcodes and things, we aren’t quite geared up for that, but we will try to give you your time. And thanks to Dave Walker for his rather splendid map!